Manufacturer and/or Supplier details can be stored in your company database. You can store company information, addresses and individual contacts. Almost all the documentation that covers customers is also applicable to manufacturers. You should first read through the documentation on customers to learn about adding basic company, contact and address data. The following page adds information specific to manufacturers and suppliers. Select Manufacturer or Supplier from the sub-menu as shown in Figure 1 below. Click the plus sign in the top right corner of the screen. Enter the basic manufacturer/supplier details (only name is absolutely required) on the form as illustrated in Figure 2 below. Click the "Create Company" to add the manufacturer/supplier to your organization. 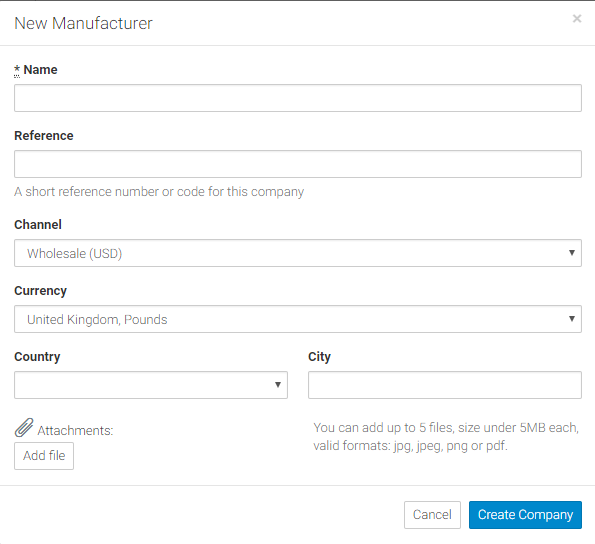 You can later edit the manufacturer's (or supplier's) name, location, currency and other settings by click the edit icon from the company details page. When creating a manufacturer, the currency you select is the currency in which your manufacturer quotes and charges. In turn, this will be the currency in which you enter manufacturing prices for associated products. It will also be the currency used when building a production order for this manufacturer. You can change a manufacturer's currency at any time. Note that this will not change the currency of any existing production order. You should ensure that a manufacturer's currency is set correctly before you start to create production orders. Also, when you change a manufacturer's currency, the currency of all product variation manufacturing price will also change. However, the manufacturing price will not automatically convert to the equivalent value in the new currency. For example, if you have a product with a manufacturing price of 10 EUR, changing the manufacturer's currency from EUR to GBP, will result in the product having a manufacturing price of 10 GBP. Stitchex also lets you enter contact and address data during the production workflow, so it isn't strictly necessary to enter all of your manufacturer data before getting started entering production orders. You may, however, have an existing spreadsheet of contact data that you want to import. You can also specify "tags" for your manufacturers and suppliers to help locate them more quickly in the future. See our Tags Article for additional information. Note: Currently, you cannot delete a individual contact that has been referenced from a production order. Navigate to the associated company for this individual. Click the "+ Contacts" icon. Click the "+ Addresses" icon. Enter at least one line of the address. You can also set other default settings for the manufacturer or supplier including favorite products, financial and tax information. You can also see Production Order History for the manufacturer from this page. Select the manufacturer from the drop-down list. Enter a production price under "Unit price" if necessary.